BEDFORD, MA -- The East Coast Wizards are back home after a difficult 3-game stretch in Philadelphia, PA. Despite battling hard in each contest, the Wizards came up the short end in their lone matchup against the Little Flyers and pair of games against the Revolution. With the trio of losses, the Wizards fell to 8-6-1 for the season. If the playoffs started today, the Wizards would be the #5 seed in the New England Conference. "That was a very frustrating weekend for our team," said Wizards head coach and general manager Freddy Meyer. "We were in all 3 games. If we get a few more bounces and execute on some more plays, we could be looking at 3 wins instead of 3 losses. We need to learn from the experience, and refocus on what's ahead." 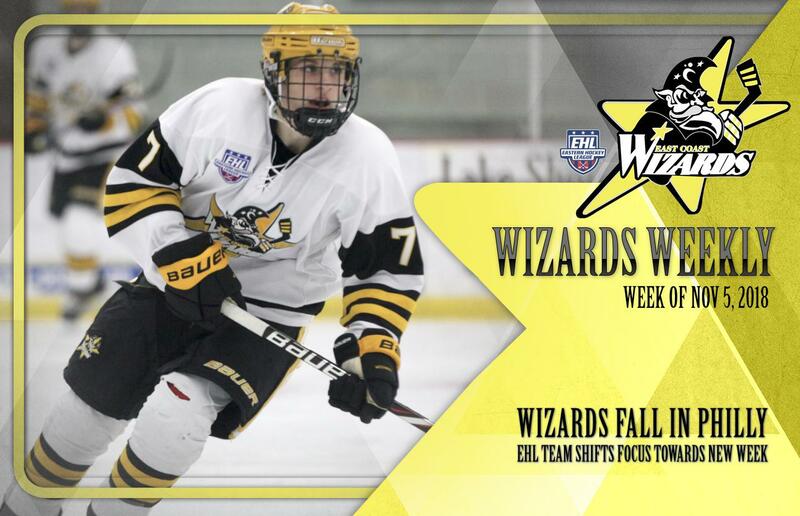 What lies ahead for the Wizards is a matchup with the Connecticut Chiefs in Newington, CT tomorrow afternoon, and then the EHL team will take on Team Maryland and the North Carolina Golden Bears at this weekend's showcase. Ideally the Wizards would love to follow up 3 losses with 3 wins, and then carry some momentum with them into their first meeting of the season with the New Hampshire Avalanche on Friday, November 16th. You can catch all the #Eshow action live on HockeyTV, and be sure to keep up on all things Wizards at ecwjrhockey.com or by searching #BringTheMagic on Facebook, Twitter, and Instagram.